New Sprouts Bushel of Fruit Fill your basket at the fruit stand! Invite early dramatic play, build vocabulary and reinforce good nutrition with freshly designed, soft, plastic produce! 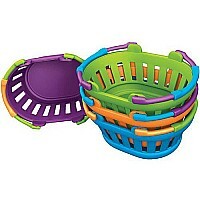 Includes apple, strawberry, lemon, banana, plum, orange, apricot, grapes and pear, all stored in a plastic bushel basket. Basket measures 4"H x 5.5" in diameter.